Listed below are some websites that may be of interest. If you find any links that are out of date, please email the webmaster with a note on which links are inactive. The CKC founded back in 1888, is at the centre of the world of purebred dogs in Canada. A non profit organization dedicated to encouraging, guiding, and advancing the interests of purebred dogs and their responsible owners and breeders in Canada and promoting the knowledge and understanding of the benefits which dogs can bring to Canadian society. The Golden Retriever Club of Canada is a National Club managed by a Board of Directors consisting of President, First Vice-President, Second Vice-President, Secretary, Treasurer, Immediate Past President and five Regional Directors representing the Atlantic Provinces, Quebec, Ontario, The Prairies & Northwest Territories and British Columbia & The Yukon. With approximately 100 members throughout Alberta and neighbouring provinces, the members of the Club are active in a wide variety of pursuits including working certificate training seminars and tests, obedience seminars and trials, and much more. The American Kennel Club (AKC) is a not-for-profit organization that maintains a purebred dog registry, sanctions dog events, and promotes responsible dog ownership. 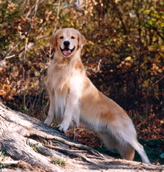 Here you can find all kinds of information about Golden Retrievers in general and in the Pacific Northwest specifically. The Orthopedic Foundation for Animals is a not-for-profit foundation established to collate and disseminate information concerning orthopedic and genetic disease of animals. Smiling Blue Skies offers 24/7 support to those whose lives have been touched by cancer. It doesn't matter where you live. It doesn't matter what you need. We'll try to help you in any way we can. It can mean anything from sending you special biscuits to helping you ship blood and tissue samples, here and in the United States, to pet loss support. New to Smiling Blue Skies, is The Smiling Blue Skies Fund for Innovative Cancer Research. Dr. Brenda Coomber, reports, "Getting the ball rolling on a novel concept can be a major challenge, and almost every cancer researcher hears the same thing from funding agencies . . . 'Come back when you have some evidence you are on the right track.' The Smiling Blue Skies Fund for Innovative Cancer Research will fill an urgent gap in OVC and the cancer centre's ability to support creative cancer research at its most fragile and vulnerable early stage." www.smilingblueskies.com is recognized as Canada's most comprehensive online source for canine cancer and is the very proud two time recipient of the Golden Retriever Club of Canada Silmaril Kennel Trophy for the human/animal bond.